Click here to buy it on Amazon! THEY WERE LIKE FAMILY TO ME is in bookstores everywhere! For the paperback, we decided to go with the title of a different story in the collection. As much as we all love the “Armadillos” title, we felt that They Were Like Family To Me is more evocative of what the book is about. And of course, a new title deserves a gorgeous new cover! EXCITED!!! Barnes & Noble selected IN THE LAND OF ARMADILLOS as a Spring 2016 Discover Great New Writers pick! A radiant debut collection of linked stories set in a German-occupied town in Poland, where tales of myth and folklore meet the real-life monsters of the Nazi invasion. 1942. With the Nazi Party at the height of its power, the occupying army empties Poland’s towns and cities of their Jewish populations. As neighbor turns on neighbor and survival often demands unthinkable choices, Poland has become a moral quagmire—a place of shifting truths and blinding ambiguities. Blending folklore and fact, Helen Maryles Shankman shows us the people of Wlodawa, a remote Polish town at a crossroads: we meet a cold-blooded SS officer dedicated to rescuing the creator of his son’s favorite picture book, even as he helps exterminate the artist’s friends and family; a Messiah who appears in a little boy’s bedroom to announce that he is quitting; a young Jewish girl who is hidden by the town’s most outspoken anti-Semite—and his talking dog. And walking among these tales are two unforgettable figures: the enigmatic and silver-tongued Willy Reinhart, Commandant of the forced labor camp who has grand schemes to protect “his” Jews, and Soroka, the Jewish saddlemaker and his family, struggling to survive. Wlodawa in 1942 is a town torn apart, but Shankman shows how even in midst of this unfathomable calamity, the people of Wlodawa—oppressors and oppressed alike—continue to grapple with the eternal human dilemmas of love and envy, freedom and responsibility, faith and doubt. 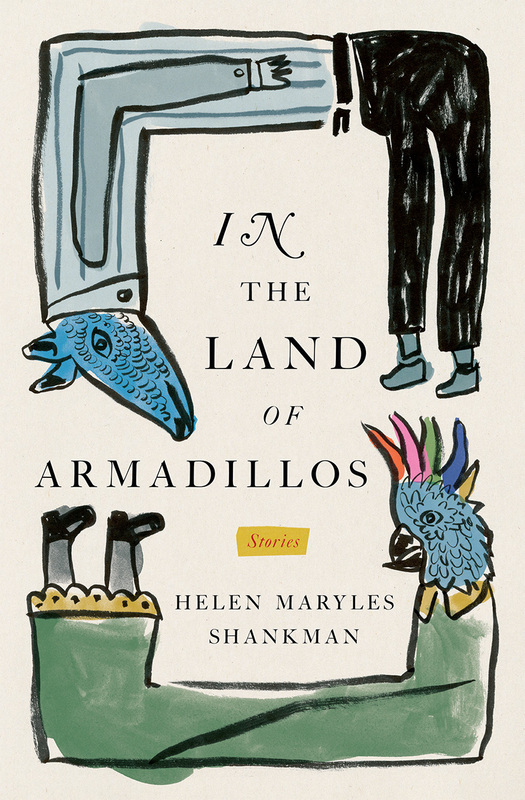 Channeling the mythic magic of classic storytellers like Sholem Aleichem and Isaac Bashevis Singer and the psychological acuity of modern-day masters like Nicole Krauss and Nathan Englander, In the Land of Armadillos is a testament to the persistence of humanity in the most inhuman conditions. The story materialized in my head a few days before Halloween, 2009. It’s World War 2. A gang of creatures, half man and half beast, attack a party of SS men executing a group of Jews. I imagined a pretty young girl stumbling over roots as German soldiers herded her toward a clearing in the dense Polish woods. I visualized a wolf standing upright, a lean, doglike head, tip-tilted gray eyes, muscular legs dressed in the uniform of the Polish Army. The story thumped home with a sense of rightness. Yes, this is good. This works. All the usual signs were there: the hair raising on the back of my neck, the butterflies going in my stomach. But on it’s heels, this: was I trivializing the Holocaust? War seemed like too serious a subject to ornament with fantasy. But whenever I tried to recreate my family’s World War 2 experiences in a straightforward way, they fell flat, just an array of twisty black letters on a white page. I put them aside, unable to make the characters and events rise from the paper, to breathe believable air. But the day I set my partizan/wolfman at the edge of the Nazis’ pit, digging through the bodies to find his oldest friend, was the day the stories came roaring to life. The day I fused magical realism with historical fiction was the day I became a writer. My parents were Holocaust survivors. Dad’s stories were haunted with tragedy. Everyone died. But Mom’s experiences were thrilling adventures, with eleventh hour rescues, fearless Partizans, handsome German officials defying their own government, heroic Poles risking their lives to hide their Jewish friends. Mom’s stories spoke of hope. Every one of my parents’ stories contained the words, “It was a miracle.” The German officer looked one way, and my uncle jumped the other way. The forest fire smothered by a giant of an uncle who, single-handedly, lifted up an enormous tree trunk and flung it down on the flames. A Nazi soldier who stood right on top of the undisguised entry door of my father’s bunker, and still didn’t see it. The welcoming arms of the Polish forest, deep and dark and swampy and ancient as the earth itself, shielding all who sought refuge. The men and women in their stories were larger than life, like characters in a fairy tale. An SS man who hid Jews in his castle, with the power to enchant his superiors; a Polish woman who cooked such lovely breakfasts that they lured away the soldiers searching for Jews in her barn; Torah scholars, transformed by the deep Polish woods into mighty resistance fighters. Believe me. It was no great leap to add a talking dog. The stories wanted to be told, and they wanted to be told in this way. There are so many books written about World War 2 that we experience a kind of Holocaust overload. Y-E-S, it was tragic. Y-E-S, millions were murdered. We’ve all read Anne Frank. We’ve all read Maus. We know this story. We know! As an author, that’s where my challenge lay. I needed to make people feel it, for the first time, all over again. And for me, magical realism was the answer. This post is part of the Magic Realism Blog Hop. About twenty blogs are taking part in the hop. Over three days (29th – 31st July 2016) these blogs will be posting about magic realism. Please take the time to click on the button below to visit them and remember that links to the new posts will be added over the three days, so do come back to read more.